“Come with me, we are going to heaven” is what this little girl Lexi remembers of her dream when Jesus took her to heaven. She relays the dream with giddiness, and joy. She remembers Jesus as being very bright, brownish hair, brown eyes with no beard. She remembers a very shiny floor, a river, trees, ponds and ducklings. She saw deer, and even chipmunks. Her dad asks if they flew up to heaven, or if they arrived immediately. She says we arrive in heaven as quick as a wink. She remembers Jesus wearing a robe, but also “normal human clothes”. Her dad then asks her what was happening outside before being taken up to heaven. She recalls things collapsing, dust in the air, flooding, and she heard screaming. Her dad asks how she knew a flood was happening, and she replied that she could see the events take place from heaven. She reveals that after the “collapse” people will come back to the earth and it will be a “new” world. When she sees the new world, she sees new animals she hasn’t seen before along with new “objects”. She was reminded of heaven when she saw the new earth. She, and I assume all of heaven was able to see the new earth being built. She finishes off the video by describing the party in heaven. She even says there was popcorn, donuts and pop in heaven. 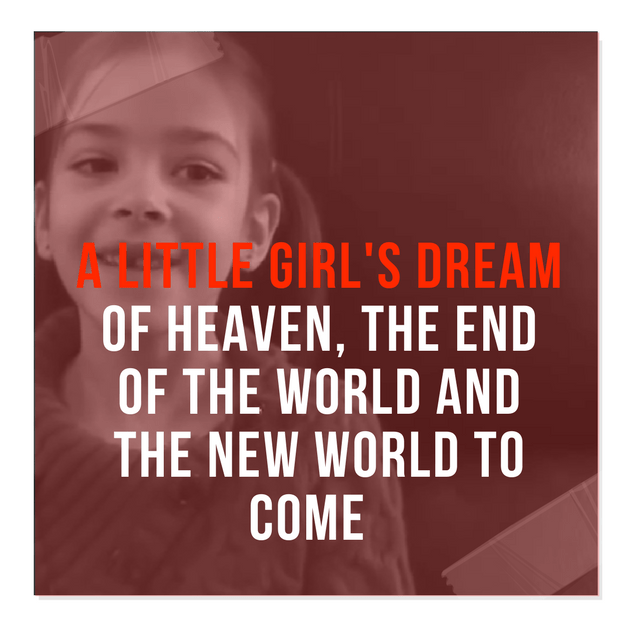 Our daughter Lexi had a dream about Heaven, the End of the World and the New World (Earth) to come. This is the first time she has had a dream like this. When she first woke up she was so excited about this dream that she had. She was so happy and excited (even though there was a lot of major things happening in her dream). In her dream angels come and take our family to heaven shortly before (or while) the Earth is being destroyed by many major natural disasters. She is familiar with the idea of Heaven, angels and Jesus but not with things like the rapture, or there being a new Earth. Christine Donley- love how she was most excited about the food and party rather than the religious orthodoxy, lol. yay kids! Next articleWhy Are So Many Believers Moving To The Upper North West Of The United States?